If you have read any of my previous posts, you have probably gathered by now that I have a slight obsession with hearts. If you hang around long enough you will learn that my obsession also extends to stars. I don't know why....they're just your basic cookie cutter shapes. 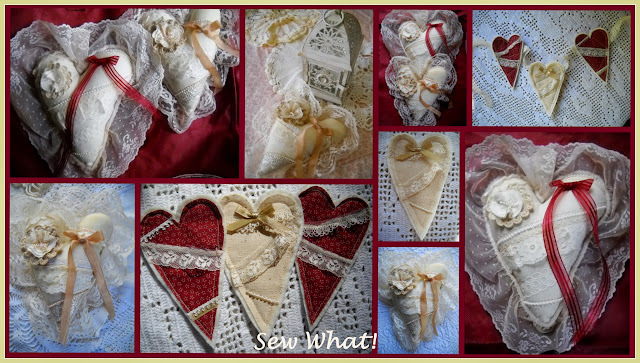 I made the hearts pictured above about a month or so ago and I posted the heart pillow with the peach colored ribbon. CLICK HERE TO SEE ORIGINAL POST. I did not post the red ribboned heart earlier because I sent it to my friend Diane at LAVENDER DREAMS and I wanted it to be a surprise. You can read about it on her blog. Thanks for stopping by....hope everyone enjoys the rest of the holiday weekend! It is still steamy here in NH. Some parts of the state are still 80 degrees at midnight. Just heard on the news that tomorrow will mark the third day of heat over 90 degrees so it will officially be a heat wave. Stay cool! Today my husband and I were off in different directions. He headed a bit north (NH) and I headed a bit South (MA). On my way home, a beautiful doe ran out in front of me. She came out of nowhere. Thankfully I wasn't going faster and I was able to slow down. It actually took me a second to process what I was seeing as I have never had this experience before. I love wildlife and I have often admired deer off in the woods or in grass by the side of the road. Sadly I have seen more lying on the side of the road which always distresses me. Anyways, that beautiful doe just pranced across the highway as though we weren't even there and she was so pretty. I wish that I had been able to capture it on my camera. I was anxious to tell my husband about it when he got home. When he arrived home, he said "guess what ran in front of me today while driving?" I assumed a deer of course. Actually it turned out to be a very large black bear. Apparently black bears can also run pretty quickly across the road. I would have loved to have seen that! Guess his bear sighting trumps my deer sighting! All this wildlife reminds me of this little guy that moved into a tree in our front yard a couple of years ago. One morning my dog Willie, was barking at something outside the porch window. He was looking up! It took me a while to see it but this adorable raccoon was trying to fit his rather plump back end into a hole in the tree. I watched him maneuver his way in and I was pretty sure he was stuck. He wasn't. Here he is....just look at those whiskers and that little patent leather nose!! Yes, I was smitten! He was cute! Every morning at about the same time (his bedtime) I would find him up in the tree backing into the hole and he would hang his head out for a while (I am sure to flirt with me) and then he would disappear into the tree for his nap. Then every evening at about dusk, we would watch him climb out for his evening scavenger hunt. Apparently getting out was a job that required both hands!!! Looks at his little hands....I just fell in love with this little guy. My dog though was not as thrilled with our little guest. I enjoyed watching his shenangigans for several weeks....then one morning he did not come back. I worried about him for the longest time. I never saw him again. Eventually the massive tree he temporarily moved into had to be taken down. It was completely hollow on the inside. (My husband had noticed one day that he could see through it) I worried that my little friend might come back and not be able to find his home. Yup, I really did love that little fellow. What a sweet little face he had! I have always delighted in watching wildlife! I had a baby skunk in my yard all by itself and I took it to wildlife rehab. He was the cutest little baby. My husband scooped him up into a laundry basket so I could transport him. Biggest mistake of my life....guess what happened?...oh it was bad! I never saw windows go down so fast in a car. Live and learn...next time I will call rehab and they can come pick up the skunk! Anyways, that is my wildlife story! As I said I love all wildlife....well, as long as it doesn't...slither.